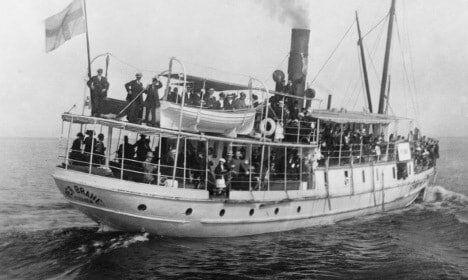 The tragic sinking of the small steamship Per Brahe on Lake Vattern in Southern Sweden on November 19, 1918, and the loss of all 24 souls aboard its decks, became a major news story that fall. This was largely because John Bauer, acclaimed Swedish artist and illustrator of children’s books was aboard with his wife and their young son. The other reason appears to be the mystery surrounding the sinking. The loss of the vessel and its crew drew headlines for days until divers found the wreck in 105 feet of water, just 1,600 feet from safety at the port of Hastholmen. The ship capsized in a November gale when deck cargo shifted. Most of the passengers were trapped in their cabins. The steamer was heavily laden with iron stoves, plowshares, sewing machines and barrels of produce as it steamed its way from Granna to Stockholm that fateful night. The ship was under the command of a Captain Boija. Evidence found at the wreck by divers and marina archaeologists say much of the cargo was stored unsecured on deck, making the vessel top-heavy. When struck by a raging winter gale, deck cargo shifted with some of it falling overboard. This destabilized the ship and caused it to capsize in the high seas. An interesting part of this story is that the Per Brahe was raised, refloated, and brought into Stockholm in August, 1922. There it made news again since it is a rare thing to see a ship moored in port after it sat four years at the bottom of the lake. It is said an estimated 20,000 people came to watch the raising of the ship and then peer at it after it was towed into port. So many people wanted to see the spectacle that special trains were put into service from Norrkoping. Newsreels featuring the amazing event were shown in cinemas all over Sweden. To finance the salvage the Per Brahe was sent on what was described as a “macabre tour” to ports throughout Sweden. News stories baited the public by creating stories about the mythical creatures Bauer drew in his illustrations. They said the creatures of the forest claimed Bauer by sinking the ship. At 738 square miles, Lake Vattern is the sixth largest inland lake in Europe. It is a long thin-shaped body of fresh water located in South Central Sweden. Our thanks to Renee for bringing this story to our attention.